[SatNews] Astrium has been awarded a contract by the European Space Agency (ESA) to develop key technologies for new re-ignitable upper stages for new launchers. Under the two-year contract, worth 20 million euros, Astrium will develop advanced technologies that will play a major role in enabling the engines of the cryogenic upper stages (fuelled by liquid hydrogen and oxygen) to be re-ignited. The project is called CUST (Cryogenic Upper Stage Technologies) and is issued under the framework of the Future Launchers Preparatory Programme (FLPP) of ESA. The work will focus particularly on fuel management in the state of zero-gravity and on the thermal insulation of the fuel tanks filled with cryogenic fuel. One of the main challenges of designing a re-ignitable cryogenic upper stage, powered by liquid hydrogen and oxygen fuel and operating in a zero-gravity environment, is that of maintaining the fuel in a liquid state. Above a certain temperature, the liquid turns to gas and there is a risk that the fuel will evaporate. Another major challenge is that of directing the fuel to the place where it is needed, namely the feed lines to the engine. 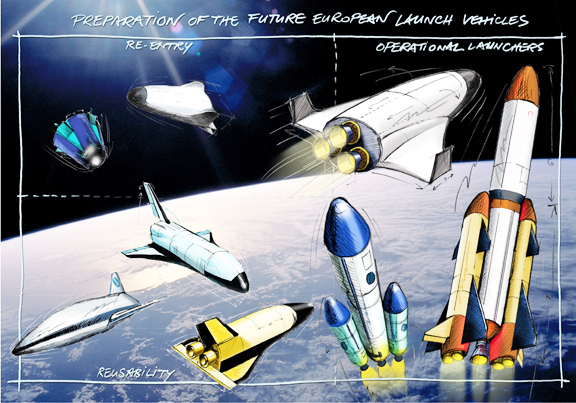 ESA's Future Launcher Preparatory Programme (FLPP) is focusing on the preparation of a Next Generation Launcher (NGL)to be operational around 2020. To remain in its liquid state, oxygen has to be cooled to below minus 183 degrees Celsius, while hydrogen requires the even lower temperature of minus 253 degrees Celsius. The widely fluctuating “outside” temperatures in space, due to variations in the intensity of the impinging solar radiation, make it very difficult to keep these highly volatile substances in their liquid state over an extended period of time. Innovative insulation concepts are therefore being developed for the fuel tanks and the upper stage itself, to minimise unwanted heat transfer to the fuel. Another challenge to be solved relates to the zero-gravity environment in which the rocket stage resides after the engine has been switched off, causing the liquid fuel to float at random inside the tank. Specific technologies need to be developed to ensure that the fuel will be immediately available at the feed line to the engine when the engine is re-ignited. To support this work, two experiments relating to cryogenic fuel management will be launched in 2011 onboard the Texus sounding rocket, as part of the Texus/Maxus program that Astrium in cooperation with German Aerospace Centre (DLR) has been operating from Kiruna in northern Sweden for over 30 years.